In a large bowl, mix egg, shrimp, shrimp powder, mashed potatoes, onion, and black pepper. Using both hands make little patties with shrimp mixture. Pour vegetable oil in a large frying pan over a medium flame. Allow to get hot. Place patties in oil, and fry on each side for about 6 minutes or until golden crisp. It's better if you use cold leftover mashed potatoes. With Lent upon us, there are certain food staples that I have inherited from my grandfather and the main and most amazing cook of the family, my Auntie Rosie. Around this time of year, every Friday when I get to my aunt’s house, I know there will be fish tacos, chile rellenos, and shrimp patties. 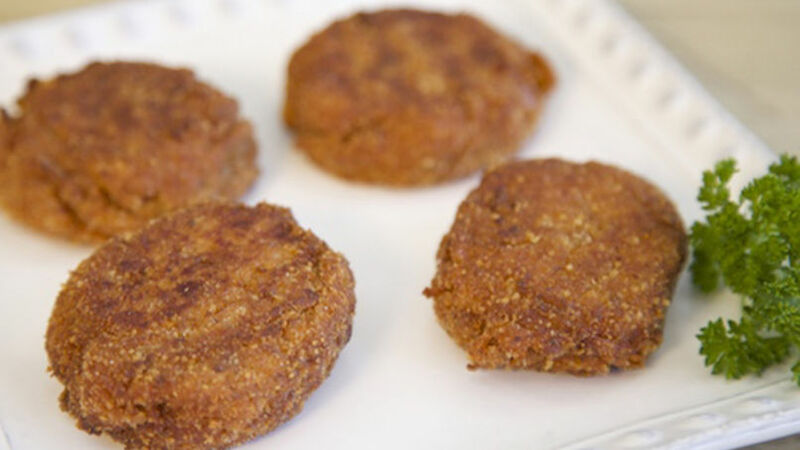 Yes, shrimp patties! I must confess I first found them extremely strange because they are made with real shrimp and shrimp powder. But don't get me wrong, though, these interesting crispy little critters are super tasty! I like it when my tía makes 5 or 6 different dips to sink her delish patties. Keep an open mind and give these a try!